The CDC’s 2017 Lyme disease statistics are in: 42,743 “reported” cases. 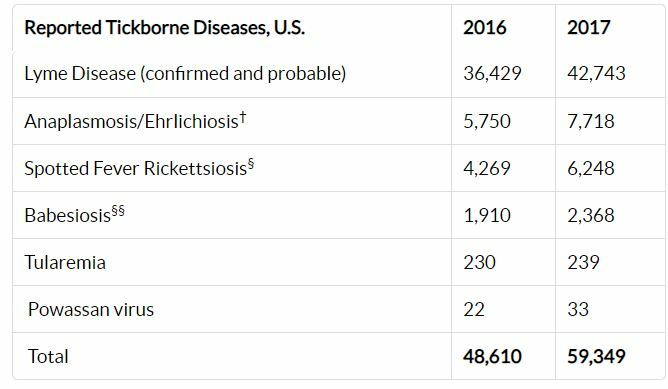 Using the CDC’s own estimate that Lyme is under-reported by a factor of 10, that’s puts the yearly number at closer to 427, 430 cases, the highest it’s ever been. “Reported” means only those cases that meet the CDC’s surveillance criteria for confirmed and probable cases. This number leaves out tens of thousands of diagnosed cases of Lyme that fail to meet that rigid standard. And of course, there’s no way to account for the untold thousands of people with Lyme who are misdiagnosed with something else. Even though the totals are higher than previous years, the number still falls way short of figures that come from non-CDC sources. As an example, the CDC says there were 145 confirmed and probable cases of Lyme in California in 2017. Yet, Quest Diagnostics reported 483 positive Lyme tests in California that year—and that’s just one laboratory. And, according to the FAIR Health insurance database, in 2016, California had 46,820 Lyme-related insurance claims. (Not individuals with Lyme. One person can have more than one claim.) Still, that’s a huge discrepancy between those numbers and the CDC’s. And that’s just one state. For years, the Lyme community has decried the fact that CDC continues to low-ball the number of cases in the US. Although the numbers keep inching up, there’s nothing here that suggests the agency is getting a better handle on the problem.